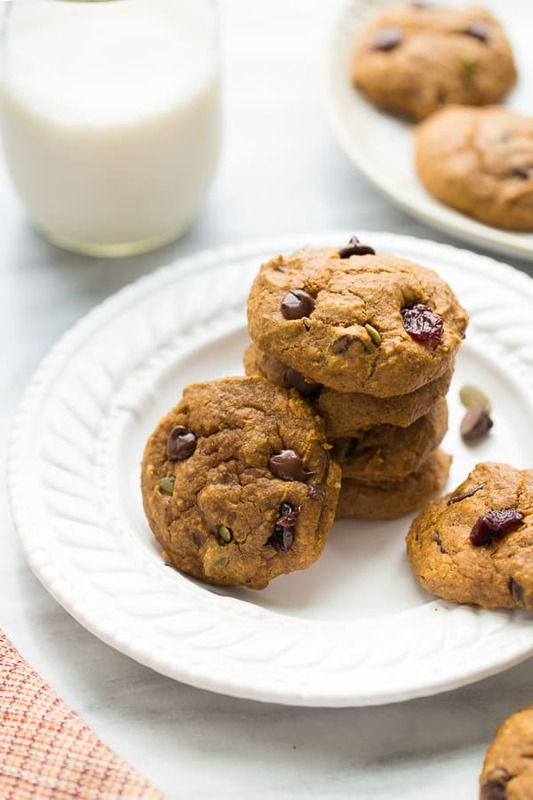 Pumpkin Power Breakfast Cookies! Healthy, gluten-free and vegan cookies. Delicious and kid-friendly! CLICK HERE TO PIN THE RECIPE FOR LATER! 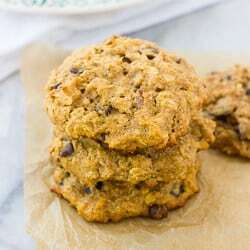 I decided to call these cookies Pumpkin Power Cookies for a reason! They are like magic. The flavor and texture is so delicious nobody will guess these cookies are gluten-free, vegan, grain-free and naturally-sweetened. 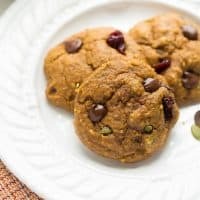 I am crazy about pumpkin baked goods and I love these cookies because they will make your house smell like fall – but from a healthy treat. 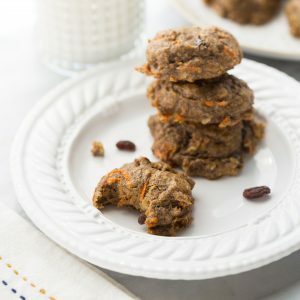 Like these Carrot Cake Power Cookies, these vegan cookies get their good texture from a flaxseed slurry (ground flaxseed mixed with warm water). The flaxseed/water mixture acts as an egg-replacement, binder and healthy superfood in these cookies. Ground flaxseed is anti-inflammatory and contains omega-3s, antioxidants, and fiber. I also love it’s nutty flavor. 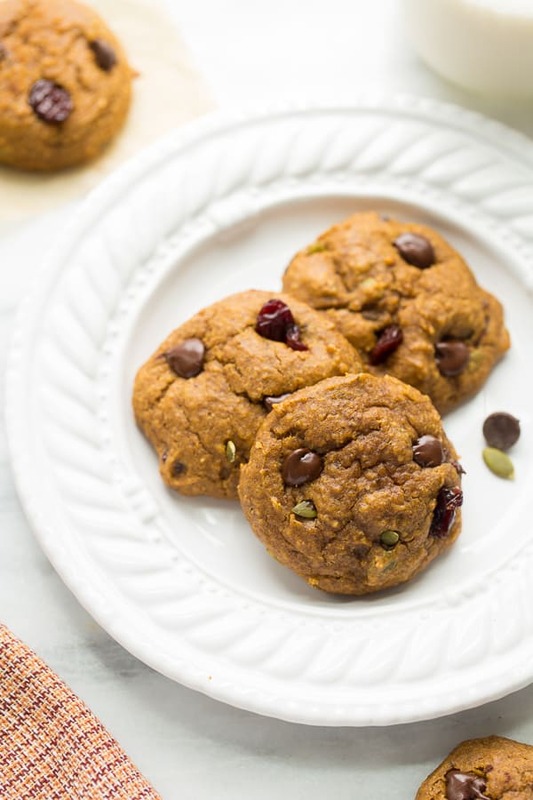 These cookies are also full of healthy fats from the almond butter and more nutrients from the vitamin-rich pumpkin. But you will mostly love these because they are delicious! Be sure to use dairy-free chocolate chips to keep these vegan. 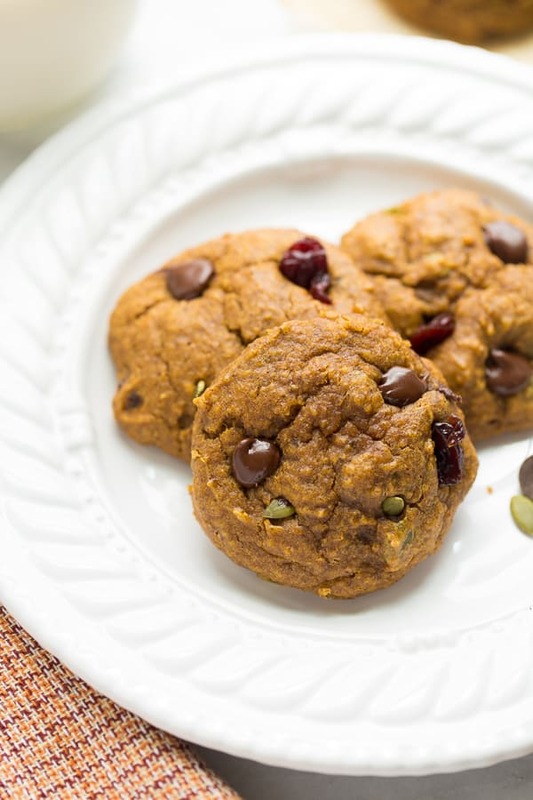 The combination of chocolate chips, dried cherries and pumpkin seeds is spot on. I love an excuse to have cookies for breakfast, but my husband and boys would also gladly eat these for a treat. They are that good! Happy Fall Baking! You won’t believe the delicious texture and flavor of these cookies. Nobody will guess they are gluten-free, vegan and naturally-sweetened! Preheat the oven to 350F. Line 2 baking sheets with baking mats or parchment paper. In a medium bowl, add the almond butter, pumpkin, lemon juice, vanilla, arrowroot powder, pumpkin pie spice, cinnamon, baking soda and salt. Place the ground flaxseed in a bowl. In a glass measuring cup, mix together the maple syrup and hot water. Pour over the flaxseed and whisk to combine. Let sit for 1 minute, then pour into the bowl with other ingredients. Using a hand mixer, beat the mixture on low until combined. Increase the speed to medium and mix until totally smooth. Add the chocolate chips, dried cherries and pumpkin seeds. Mix to combine. Scoop the cookie dough (in 2 tablespoon mounds – don’t make them too big) onto the prepared baking sheets. You should have 16-18 cookies. Bake for 18-20 minutes. Let cool for 5 minutes then transfer to a wire baking rack to cool completely. Enjoy! If storing more than a day, store leftover cookies in the refrigerator. Heat the cookies for 5 seconds in the microwave before serving if desired. Be sure to use dairy-free chocolate chips to keep these vegan. This post contains Amazon affiliate links to my favorite products. Any substitute for arrowroot powder if I want to make these right now and don’t have any?? I think tapioca starch or potato starch might work! I would love to be able to print this recipe without an ad in the middle of it requiring two sheets of paper. Any tips on how I can do that? These are yummy! I did leave out cherries and seeds! Thank you! Can I use ground chia instead of flax seed? I just made these for Thanksgiving but left out the cherries and pumpkin seeds. They turned out great and were super fluffy and soft. I’ll definitely be making these again. Thanks so much! cookies for breakfast what’s not to love! What could I substitute for almond butter- I don’t have any on hand. You can use peanut butter or any other nut butter! Anyone tried making these into bars instead of cookies? What size pan? How long to bake?